Want to understand one of the greatest mysteries in the universe baffling scientists right now? In this physics lesson, discover the concept of dark energy! Energy is a tricky concept to explain, but in this lesson with physics teacher Chris Stoker it'll be a breeze to understand the conservation of energy! You eat food everyday containing calories, but do you know how scientists measure the energy in a calorie? Learn how to measure energy in this lesson. Learn how energy transfers in a swinging bowling ball. Could you shut your eyes while it swings at you? Learn why it's not a bad idea in this physics lesson. Now that you're familiar with concept of energy, in this physics lesson, learn the basic principles and formulas for calculating potential energy! With Newton's Cradle, why do two balls swinging on one side never kick out one ball on the other side moving twice as fast? Learn why in this physics lesson! Is it possible to measure bounciness? In this physics lesson on energy, learn a formula to find which is the bounciest ball, and measure change in temperature. How much does air resistance affect a Nerf gun and a swinging bowling ball? This physics lesson explores experiments and calculations to figure it out! How does a pulley system make it easier to lift something? In this physics lesson for beginners, learn about work, and how it relates to force and distance. Why do hiking trails zig-zag up a mountain rather than going straight up? 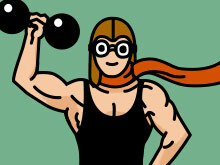 In this hands-on physics lesson learn why by reviewing the basic formula for power!